I was really lucky recently to attend a presentation by Al Gore, former US VP and environmental activist and advocate. While his talk focussed on sustainable investing (which is one necessary aspect of sustainability), the points he raised and discussed apply to all of us and affect us all. I cannot deny watching the trailer for his forthcoming second movie ‘An Inconvenient Sequel‘ was a punch in the stomach and made me quite emotional. There are thankfully a lot of brands and people that can help anyone be more eco conscious. There is so much information out there, people cannot ignore the issues created by plastic production and pollution anymore. While I accept that leading a completely plastic free and eco friendly life is virtually impossible (at least if you live and work in a big city and/or have a toddler! ), I also believe that little steps undertaken by everyone will slowly turn the tide on plastic. I have thus decided that most of my Xmas presents this year will be bought following an eco conscious approach. hopefully they will be well received of course! Below is a list of ideas to help anyone who feels similarly eco inspired. I will also follow up with a post on non Christmas related ideas, as there is so much more to talk about. Let me know if you have discovered anything else worthy of mention! I think most of us, in the UK at least, know the problems created by the take away cups that coffee shops give out to customers. It’s an enormous environmental disaster because the majority of these are not recycled due to the waterproofing layer on the inside of the cup. Even if they are made by compostable material such as the ones by eco pioneer Vegware, they still cannot go into the regular ‘food waste’ bins some of us have in our household. In fact, they have to be sent specifically to composting plants (who knew, hey?). So the best solution is to get yourself and your friends and family a reusable cup. Despite some of them being made with plastic, I believe it still way better to use one of these than to produce land fill and related problems. 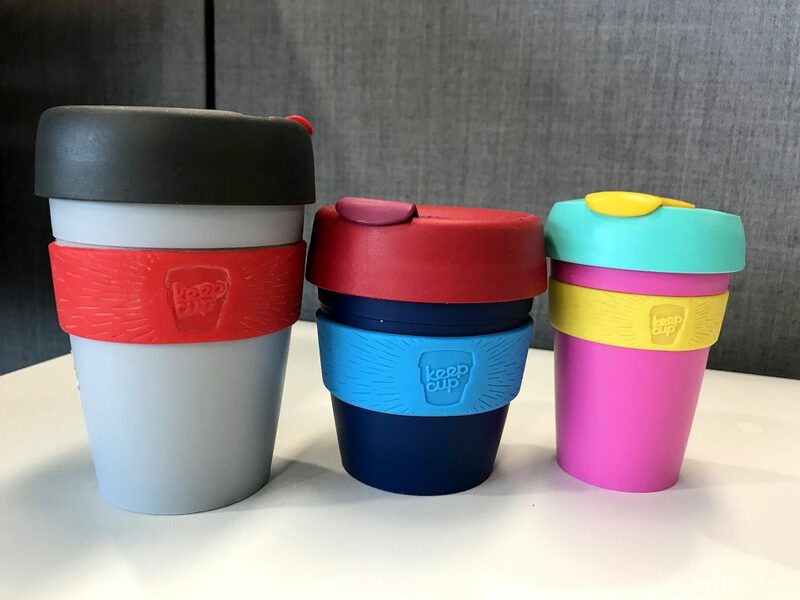 There are a few brands around yet my favourite is KeepCup; I have 4, having bought my first one years ago when nobody even knew what they were and they were only available in quite dull shades of grey. I have since bought an 8oz and a 6oz (perfect for flat whites), as well as another 12oz which I keep in the office. I barely travel anywhere without one of them, and I think they are great. 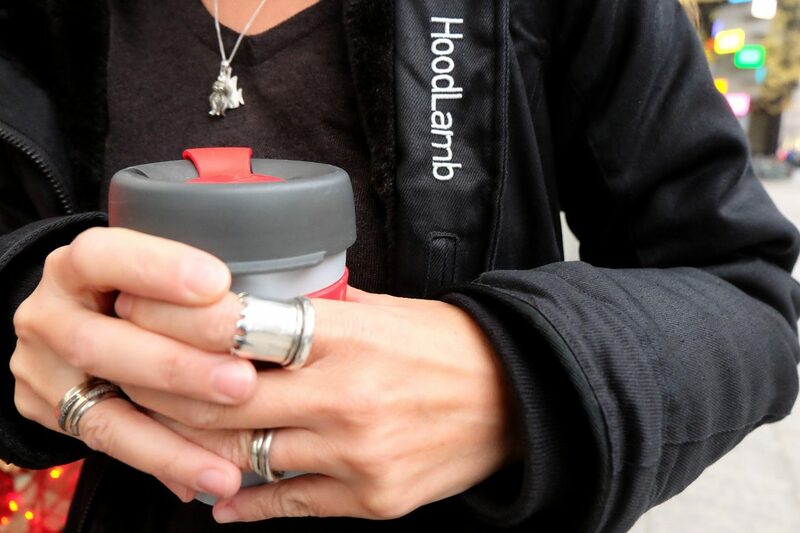 The drinks maintain their flavour and are quite easy to carry, and the drinking point is comfortable and leak proof. Straws are another disastrous thing, and one we can really do without. 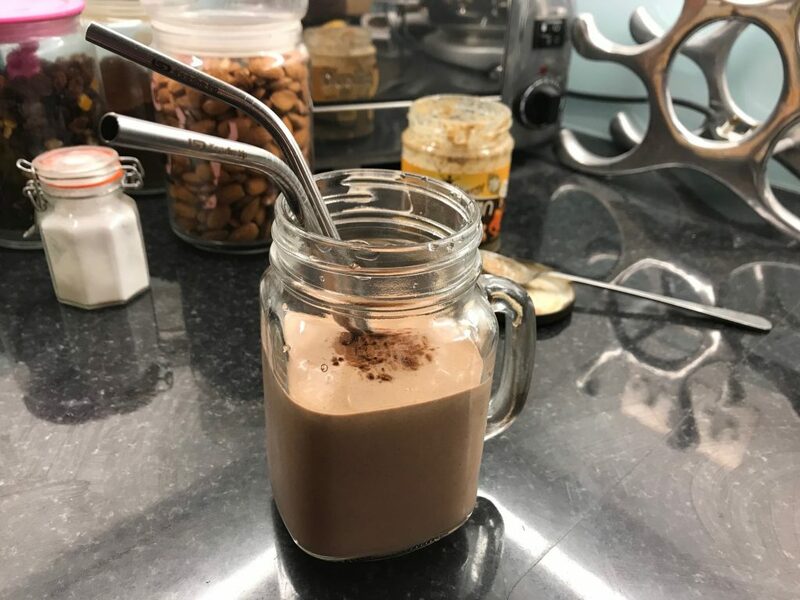 Plastic straws should be banned without a second thought! Until that becomes the norm, then a great option to avoid them is to buy bamboo or stainless steel versions. I have both and like both, but the stainless steel ones are also quite elegant in my view. They are inexpensive and, while you would need to remember to bring one with you next time you go out for a cocktail or a juice, they are definitely worth the effort. A really cool site for plastic free living sells both options, and if you use this link you’ll get a discount code. To be fair to them, lush was one of the first companies out there to produce solid shampoo and conditioner, and they still do. There are other brands out there so the message is spreading. Shampoo and conditioner (as well as body moisturiser and even toothpaste) in solid bar form require no packaging; moreover, you can take them with you in your hand luggage without the need of a plastic bag – win win! I bought a couple recently from lush and I love their smell and how they work, although when scubadiving with my very long and fine hair, I do need a boost of liquid conditioner at the end of the diving day! 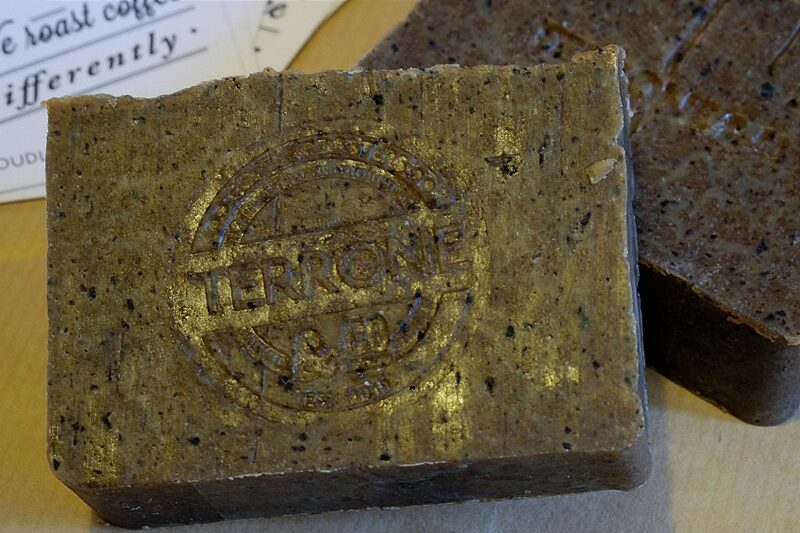 Coffee soap I made in 2017 for Terrone & Co. The above concept of course goes for solid soap bars – I have been making my own for years, and have been selling them for charity although at the moment production is on hold. Anyone interested though, do let me know as I will resume shortly! I used to be a fan of Nespresso. Not that I don’t like the coffee anymore, I do, but I use it less than my regular ground coffee and mainly for decaff options. The brand’s detractors of course criticize the environmental impact that the pods have on the environment. While the company recycles them and even provides postage free collection bags (in some countries like the UK), I am sure a massive amount end up in landfill. 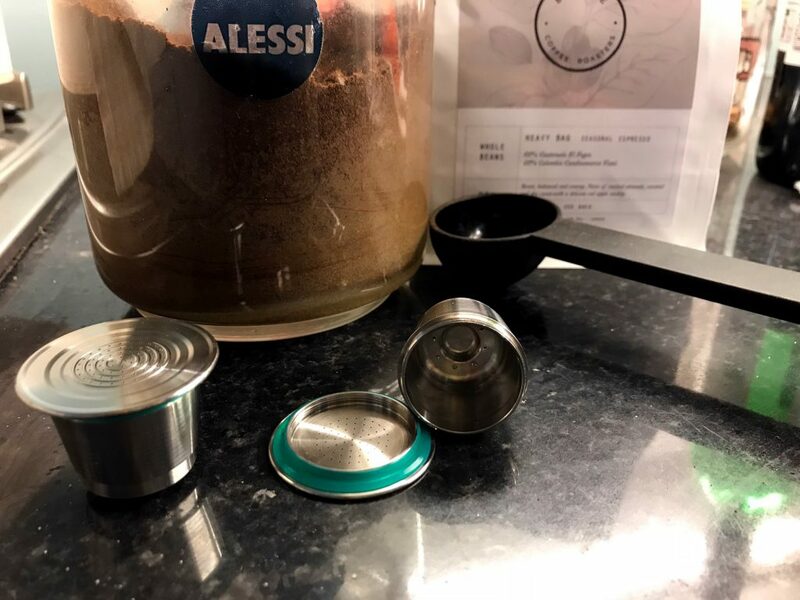 Moreover, since the patent expired, plenty of other coffee makers have been producing their own coffee pods, mostly in plastic which is even worse than the original (aluminium). I had already looked into reusable pods, not really finding anything suitable (plastic and more plastic!) until recently, when I came across some pretty looking stainless steel pods. These can be opened and closed by screw cap and are of course Nespresso compatible. It defeats the purpose a little, because it requires manual effort; lack of it is the beauty of Nespresso coffee ‘making’. Yet I am hoping that those who will receive one from me as a present will make good use of it, thus reducing their foot print a little bit further. They are available on Amazon and eBay (where I got mine). In our workplace we use a ton of plastic cutlery, because our canteen offers it. We’re all guilty of picking some up when we get our take away food and they just go to landfill, I fear. We’ve decided to get actual cutlery to keep in the team to share / wash / use, but why not buy a set of travel bamboo cutlery, in their own cute pouch with a brush to clean them? I bought mine from the same website mentioned above (yeah, you can guess I have placed quite a few orders!) and I can’t wait to receive and start taking them with me. I also bought a cute set for the toddler and he loves them too. The website stocks a lot of other ideas for stocking fillers such as eco dental floss (loving my cardamom scented), cotton buds, reusable make up remover pads etc. I have used a coconut scrubber for years. My original one is an actual piece of a a coconut shell, dried and cut like a ‘tongue’. I have had it for so long but it’s still intact, never smells or rots and it’s perfect for scrubbing casseroles and similar. I do not think these are available anymore, but the coconut scrubbing continues and now there are many forms of kitchen scourers and pads made with coconut. I got some from one of the charities I usually support; the Marine Conservation Society have a campaign called #StopThePlastic tide and have a Facebook group on plastic free living tips worth visiting. Their online shop has some nice scouring pads for washing up, so buying from them will also support the charity’s work! Using a refillable bottle is almost an established habit, particularly with gym goers. There are a lot of different options on the market and in the recent months loads of outlets in London (including the Tate Modern) have launched ‘free taps’ to offer refills in an effort to #StopThePlasticTide across the capital. Really, there is no excuse on this one either, this is something everyone should be doing. I am so used to avoid buying single use plastic bottles that last week, while traveling for work, I parched myself but refused to buy water, getting more and more annoyed for forgetting my refillable bottle. I did have my keepcup so at least I had a coffee! 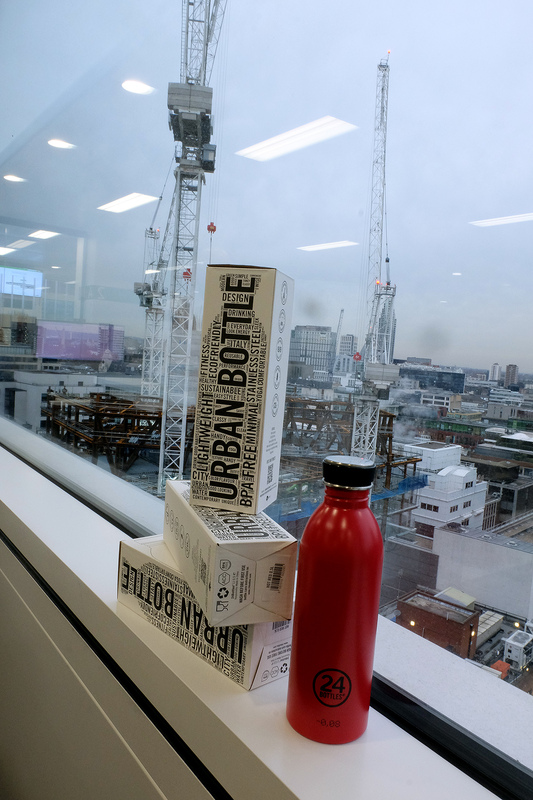 A reusable bottle would therefore make a good gift even for someone who already has one, because you can use it anywhere: home, work, gym, traveling. So to pick one amongst many, I’d recommend 24Bottles. They are in fact, an Italian brand, but sold worldwide. The bottles are nicely designed and the company is the only zero emission company to make such product so it’s sustainable on all levels. They are entirely carbon neutral and support projects such a reforestation. The bottles are light, and smart looking. I needed a new coat recently, and I had been looking at a certain Canadian brand which makes beautiful parkas and winter coats and it’s super expensive. I had a look at their sustainability policy and their down feather sourcing and that’s when I made up my mind once for all. No more down feather for me. I eat meat, but plucking live birds for the sake of keeping warm it’s not right (similar reasons make me not eat foie gras or halal meat). So I looked into ethical brands, and found many yet the majority US based, and shipping from the US was not an option due to customs duty. A friend pointed me towards a Dutch brand called Hoodlamb and I ordered my new coat from them. Risking it because I could not try it. nor see it before buying, once the big recycled and recyclable box arrived from Holland I could not have been happier. The coat is beautiful, warm, has loads of pockets and even hand warmers. I love it. I paid 339 euros which is not cheap, but surely a fair price for a warm winter coat and way less than such big Canadian brands. This is a truly cruelty free coat and is made using centuries’ old hemp fabric tailoring. It’s ‘vegan’ and while Made in China, their local working policies are clearly highlighted on their website too. If you’re looking for a big present for someone special with a conscience, this is an ideal brand. This is another brand I have only just found out about and I do not own anything from, however I love the fact that the fabric is made with 78% ECONYL® regenerated Nylon yarn, produced from ghost fishing nets and other nylon waste. As a diver, this makes huge sense: countless of times I have removed long lines of discarded or broken fishing nets from the reefs. It can kill wild life in a painful way. 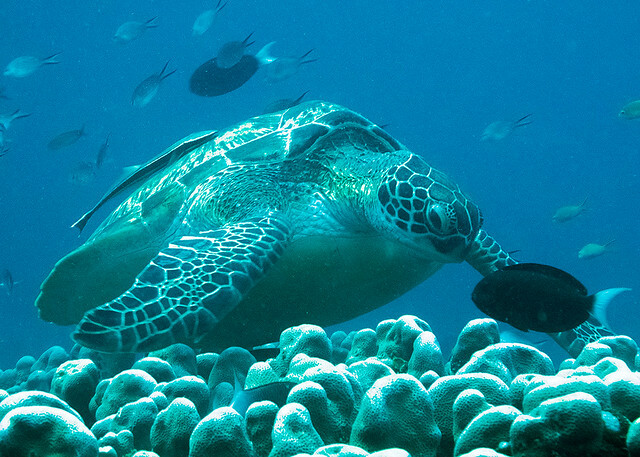 Besides each purchase is helping to save the oceans, as they support the SEA LIFE Trust, whose vision is a world where our seas are healthy, protected and full of diverse marine life, by donating 100% of profits from the sale of the new Black Pack collection to the SEA LIFE Trust. The Shadow Vee Back has a subtle use of mesh lifts this swimsuit out of the ordinary. Their Ecotech fabric is soft, has great stretch and is breathable providing a unique mix of muscular compression and comfort. Ecotech’s innovative construction also means it is twice as resistant to chlorine, sun cream and oils as competitor fabrics. I love these shoes! Actually I do not own a pair of Rothys, because I have not yet bought one.. but I love the look of the pointy flats particularly, and aim to get myself a pair asap. Rothy’s knit uppers are made from 100% post-consumer plastic water bottles. They aim to use recycled and renewable materials in their shoes and streamlined packaging. They have a store in San Francisco and, like Hoodlamb, produce in China in a controlled environment providing support and meals and fair wages to their workers. Globally, 91% of plastic is not recycled. When I travelled through Zurich in the summer, I came across some interesting looking bags hanging from the ceiling of boutique hotel 25 hours Langstrasse. Fast forward to last week, and I actually spent three nights in the hotel with work. One of those bags was also provided in the room, to be borrowed and used during the stay. Freitag is a Zurich born brand which reuses and upcycles lorrys’ tarpaulins. The material is strong, waterproof and pretty quirky. The bags are all unique, and while not exactly cheap, they are a statement piece and an interesting way of avoiding land waste production. Their story is fascinating: In 1993, graphic designers Markus and Daniel Freitag were looking for a functional, water-repellent and robust bag to hold their creative work. Inspired by the multicolored heavy traffic that rumbled through the Zurich transit intersection in front of their flat, they developed a messenger bag from used truck tarpaulins, discarded bicycle inner tubes and car seat belts. This is how the first FREITAG bags took shape in the living room of their shared apartment – each one recycled, each one unique. They make loads of accessories too, from iphone cases to diaries. Worth a look. Thank you Joli for alerting me to this brand, I have already placed an order for one of their belts. This is a British brand with an ethos similar to the above Freitag, but with an added bonus: 50% of their profits go to charities such as the London Fire Brigade. The story? In 2005 they had a chance encounter with the London Fire Brigade. When they learned that London’s damaged decommissioned hoses were headed to landfill they mounted a rescue and set up Elvis & Kresse to save it. For over a decade none of London’s fire-hose has gone to landfill and over 170 tons of material has been reclaimed. 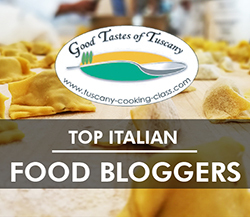 Brilliant ideas and really nice pieces. Price range: £40 for accessories and above, to £1200 for a leather large carpet.